I know I am opening a can of worms with this post. I have commented about this article on Facebook and been taken to task for ignoring the needs of striving readers. Let me state categorically, I am not ignoring those needs. However, I am questioning the use of "technology" (apps and programs that can change the level of the text to accommodate the needs of the reader) in terms of several statements the programs make. This is all related to the post about adult authors sanitizing and simplifying their books for a YA market which ran here last week: http://www.nytimes.com/2014/10/08/business/media/laura-hillenbrand-jon-meacham-adapt-titles-for-children.html?_r=1. And Liz Burns responded brilliantly to this piece, so I will add only a link to her post: http://www.lizburns.org/2014/10/there-is-nothing-wrong-with-writing.html. Here is the article that set me thinking: http://hechingerreport.org/content/tailor-difficulty-school-text-childs-comfort-level-make-sweat_17618/. The question posed was whether texts should be given to kids at their frustration level or their comfort level. The very question bothers me. Why give kids things that frustrate them if we want them to gather information from the text? If I am looking for information about how to uninstall an app, I want clear, precise, easy to understand material to read. I do not need more. But the article goes further, touting programs that can individualize reading levels from student to student. Here is the assertion about the value of such programs: "First, new-generation leveling tools like Newsela allow every student to read the same story, albeit at varying levels of complexity. “This facilitates the social learning that happens when students engage in a shared discussion of the text,” Cogan-Drew notes." So, let me ask this: are students indeed reading the "same story"? I don't think so. First and foremost, I do not think any TWO of us read the "same story." The second claim that these services, programs and apps remove the stigma of leveled texts in more traditional forms (i.e., a book or newspaper): "Second, digital reading programs can make leveling more discreet, preventing students from being teased or stigmatized for reading at a lower level. Compared to the large numbers emblazoned on the covers of many leveled-reader print books, the computerized versions call far less attention to the degree of competency of their users." I guess I must be missing those numbers emblazoned on covers of books. If they are there, someone has added them. Trade books do not come emblazoned with reading levels on them in plain sight. At least not the ones I read. Further, these stories come with quizzes. Calling them formative assessments does not make this read-and-then-answer-questions-at-the-end any different from anything else in a textbook, worksheet, or test. We are measuring only one aspect of comprehension: the ability to recall details. There is no higher order thinking going on here. Finally, there was a comment after this article that caught my eye. It began like this: "The practice of “leveling” texts relies on two faulty assumptions: that texts actually have identifiable, discrete levels, and that a text should be matched precisely to “where we are.” Much of the literature we read exists at many levels at once." 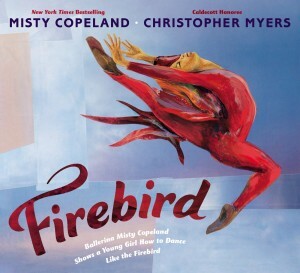 I am fairly certain that this picture book by Misty Copeland with illustrations by Christopher Myers is below my ZPD. I cannot give you that measure because there are no numbers from AR or Lexile.com. The book is too new. However, I can tell you that I am absolutely, positively sure it is below what those sites would recommend for me. What a shame that I would miss this glorious book with its rhythmic text and illustrations that convey mood and tone because some measurement put it into different hands. Books are not numbers. Kids are not numbers.